Artist Lawrence Viariseo works on an Italian street painting of Steve Jobs during the Palo Alto Festival of the Arts in 2012. File photo by Timothy Roper. What do you get when you bring together more than 150,000 people, hundreds of artists and crafters from across the country, local food vendors, live music and Italian street painting? The annual Palo Alto Festival of the Arts, of course. The family-friendly event will return to University Avenue in downtown Palo Alto Aug. 22-23 and will bring in more than 300 fine art purveyors, food and wine booths and kids' activities. The event runs from 10 a.m. to 6 p.m. Admission is free. The festival, which is sponsored by the Palo Alto Chamber of Commerce, will also feature the Italian Street Painting Expo, a showcase of 60 artists creating chalk art on asphalt canvases on Tasso Street. Funds raised by the expo benefit the Palo Alto's nonprofit Youth Community Service. The Chamber recommends that festival-goers bring tote bags for easy transportation of purchases. Festival-goers are encouraged to use public transit or ride a bike. However, free parking is also available within a block or two of the festival site, with parking for disabled patrons in all city lots. The Weekly is a sponsor of the festival. For more information, go to mlaproductions.com or call 650-324-3121. Don't miss this year's special festival promotion! The Chamber will be selling Festival Passports with free items and special retailer discounts valid during the weekend from 30 Palo Alto merchants, from West Elm to Letter Perfect and Day One Baby to Gleim Jeweler and Garden Court Hotel. The Passports are only $5 and worth over $1000 - and the first buyers will also receive a special festival bag. You can purchase them during the Festival at the Information Booth at University and Bryant or in advance from the Chamber at 355 Alma or call 324-3121. 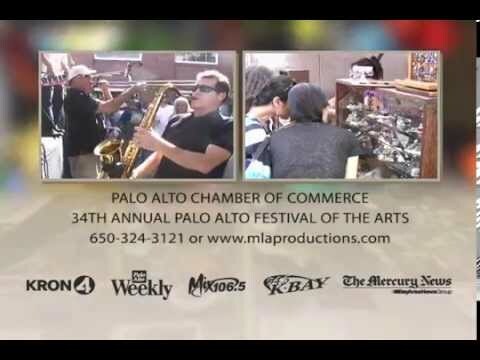 The Palo Alto Chamber is proud to annually host this wonderful festival that contributes to our community's vitality - and this year we are honored that the Palo Alto Medical Foundation is the Festival Presenting Sponsor. I would prefer if this event was in a park. A much more pleasant environment, and not shutting down our main street. The idea of having the event on Uni Ave is that it would drive business into the adjacent retail stores and restaurants as well. That wouldn't happen at a park. Given that the PA Chamber of Commerce is sponsoring the event - I think it's obvious why it is on Uni Ave. I have asked Univ Ave retailers over the years, and it universally drops business during this weekend. Event attendies do not enter the stores, and regular customers are blocked. Its not producing the desired results. I don't feel that the festival shuts down University Ave. Streets aren't made just for cars. While motor vehicle traffic is detoured to adjacent streets, this main shopping artery becomes an even more vibrant part of the community. Martin: Actually your statement is NOT universal at all --speaking from a business with three retail shops on University Avenue. These events draw a different crowd altogether to the downtown, a crowd that wouldn't otherwise come. If anything, the flows to the business are higher than average. In addition, it is welcome change from the everyday noise and fumes of the traffic on University Ave. It is the opinion of many retailers -- less a few noisy ones -- that University Avenue should be shut down more often for these types of events, if not permanently, for the walkability and attraction to the downtown. It should be called Festival of Commerce. Sadly some people can't tell the difference. Thank you for posting my big brother, Larry's picture, in this article!! It meant the WORLD to him to participate in this street fair back in 2012. He passed away only a few months after this picture was taken. I don't think anyone even realized he was a paraplegic and how hard it was on his body to sit there for hours drawing this beautiful portrait of Steve Jobs. We grew up on Catlson Circle and went to Ohlones Elementary, Wilbur jr high and Cubberley High school. Larry never left Palo Alto like my sister and I did. He loved it there. It was just a part of him and this was just one of the many ways he could show his appreciation for the town he truly loved so very, very much. And to all of you who may have seen my brother ride by them on his bicycle with that beautiful, bright smile, had no idea that an angel right here on earth just crossed past them. RIP, Larry. I miss you more than words could ever express.